I don’t think that I’m going out on too much of a limb here to suggestion that Saudi Arabia is generally an intolerant country. Don’t get me wrong, I’ve met many Saudi people in my lifetime and they all proved to be exceptionally kind and warm and friendly to me and I myself would like to even one day visit Saudi Arabia. But when it comes to social issues in the Kingdom, the country itself gets a big fat ZERO on the tolerance scale. Now, perhaps this sort of commentary on a tattoo blog seems out of place to you. I disagree (obviously) for one simple reason: tattoos are entirely about tolerance – the need for tolerance or the ability to tolerate. If you are tattooed, you want to know that where you are in the world is going to treat you with the same respect that a non tattooed person would expect and receive. Well, I don’t think that Saudi Arabia is a place where the tattooed can expect to be treated justly. 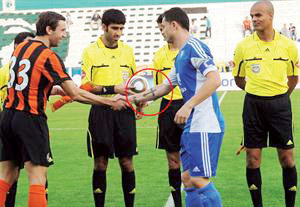 The most recent bit of news to surface from Saudi Arabia regarding tattoos is that The Commission for Promotion of Virtue and Prevention of Vice (commonly referred to as the religious police), in the Saudi capital city of Riyadh, has urged the General Youth Welfare Presidency to force foreign soccer players in the country to cover any and all tattoos that they may have. The religious police believe that this is necessary to prevent Saudi youths from attempting to imitate their tattooed soccer heroes. ‘In the directive sent to the undersecretary of the presidency, the commission drew attention to the fact that the media carried recently the photo of the Colombian player with a tattooed arm. It is noteworthy that the commission had intervened following a media outcry after noticing wearing of cross by a Romanian professional of Al Hilal Club last year. Now, I don’t want to stir the pot too much on this issue, but first and foremost, I would hope that the Saudi government does not force foreign soccer players to cover their tattoos. If they do implement this law, then I would hope that foreign soccer players would cease signing with Saudi clubs in protest of such a ridiculous law. Second, I find it more than a little hypocritical that major controversies have arisen in the past few years in Europe and elsewhere over issues like in France where the wearing of veils by Muslim women is banned, only to receive a great deal of flack. After all, veil wearing is not in line with French customs and traditions, so why should the French be asked to comply with it? I personally think that anyone should be able to wear what they wish and express themselves how they wish, but this has to go both ways. Hopefully the ridiculousness of all this type of stuff will one day disappear and visible tattoos in Saudi Arabia will be as common as visible veils in France.